I feel… I feel… I feel… HAPPY OF MYSELF!!!! 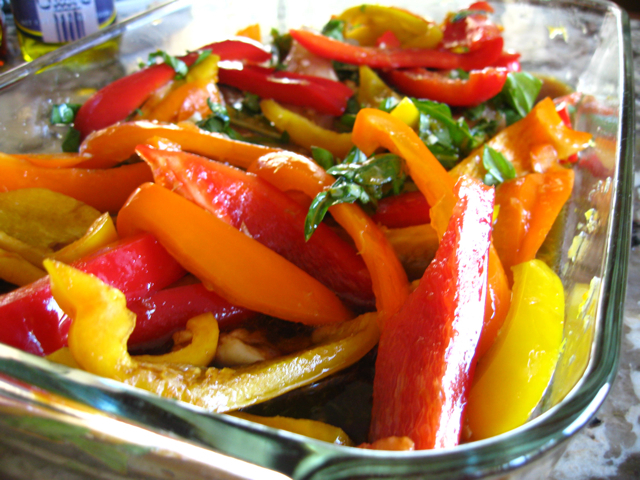 Honey Basil Chicken and Bell Peppers – You can find the printable recipe HERE. 1. 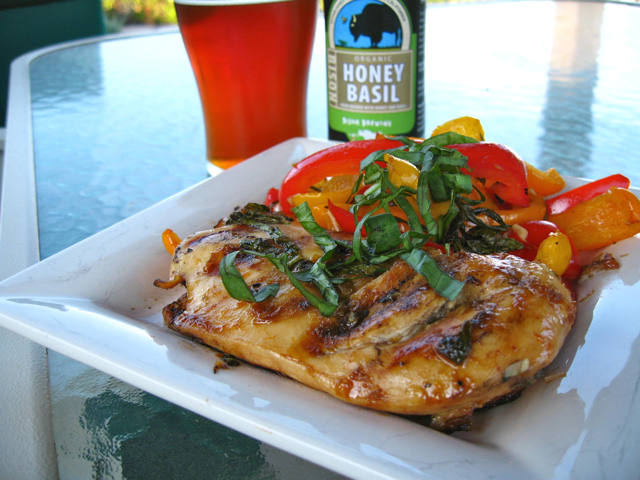 Open up a bottle of Honey Basil Ale and pour into a perfect pint glass to get you in the mood. 2. 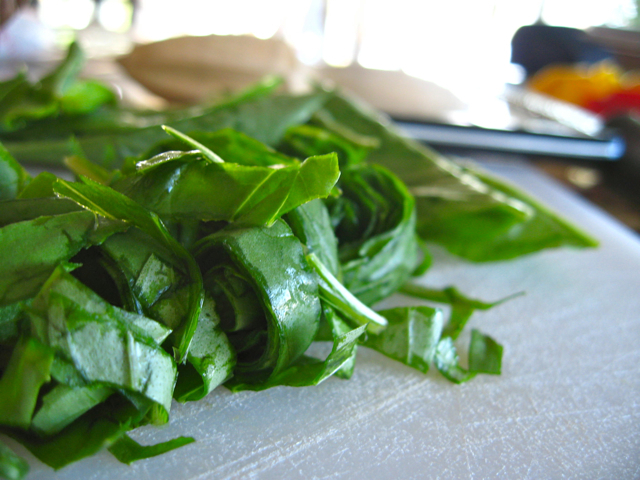 Wash the fresh basil, then roll it and Chiffonade. 3. 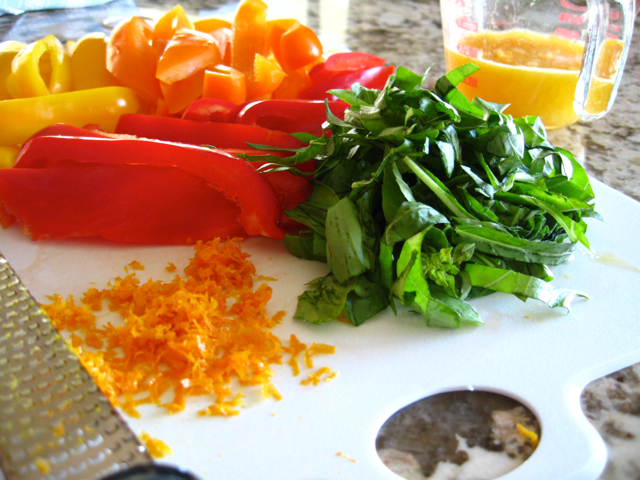 Prepare all the other ingredients, mise en place. 4. In a large baking pan, combine the orange juice, zest, honey, balsamic vinegar, olive oil, minced garlic, salt, pepper and basil, and stir well. 5. Add the bell peppers and chicken and toss to coat. 6. 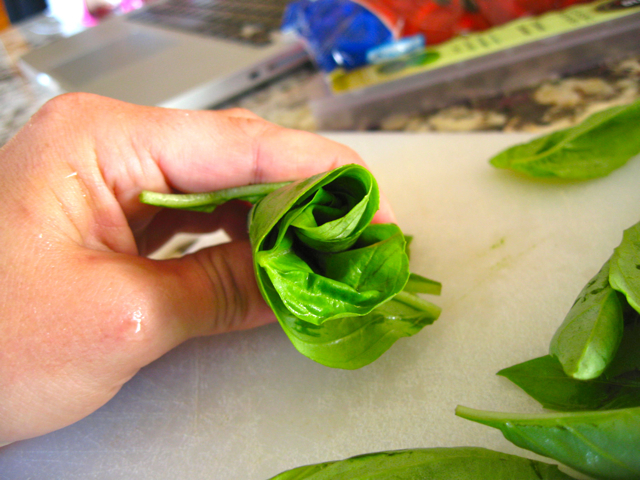 Cover and let sit for 2-4 hours in the fridge, tossing often so all ingredients marry. 7. 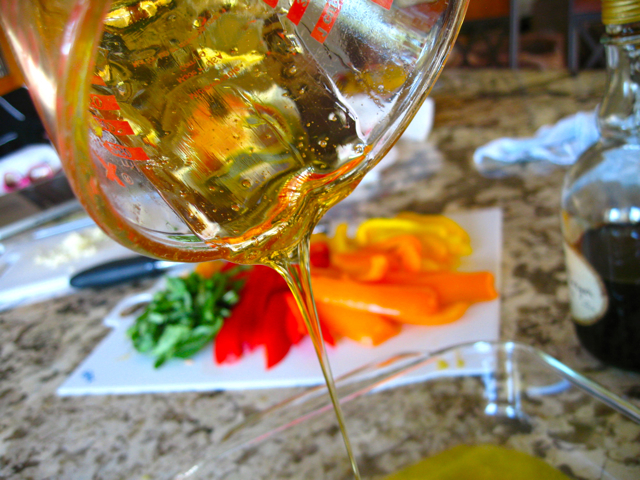 After marinating, pull the chicken and bell peppers out, and pour the marinade into a small saucepan. 8. 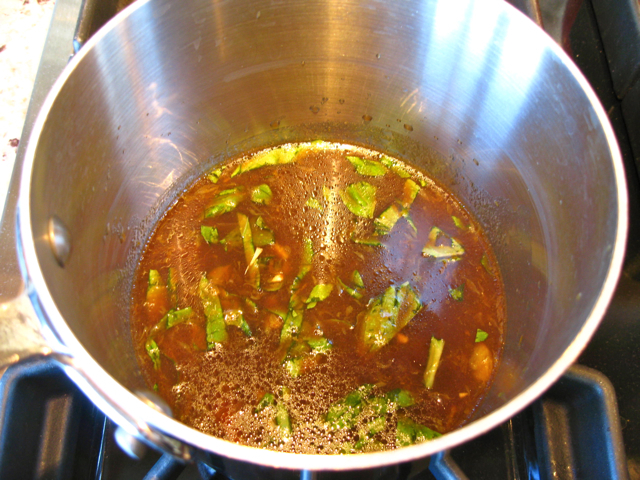 Bring the marinade to a boil to kill off all the evil salmonella/raw chicken poisons. 9. 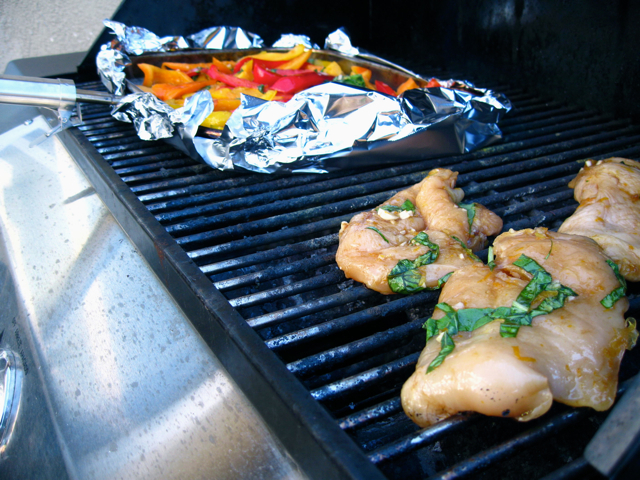 Put the bell peppers in a grill pan and place the chicken on a grill over medium heat. 10. After 5-12 minutes (depending on thickness) flip the chicken. 11. Spoon the marinade over both the chicken and the bell peppers (stirring the bell peppers continuously). 12. 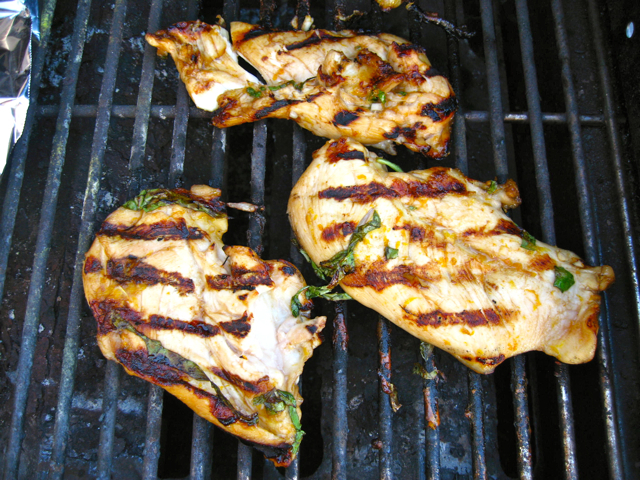 After 5-12 minutes, flip the chicken once more and spoon more marinade over the first-cooked side. 13. Remove the chicken breasts from the grill and let rest for about five more minutes while the bell peppers finish cooking. 14. 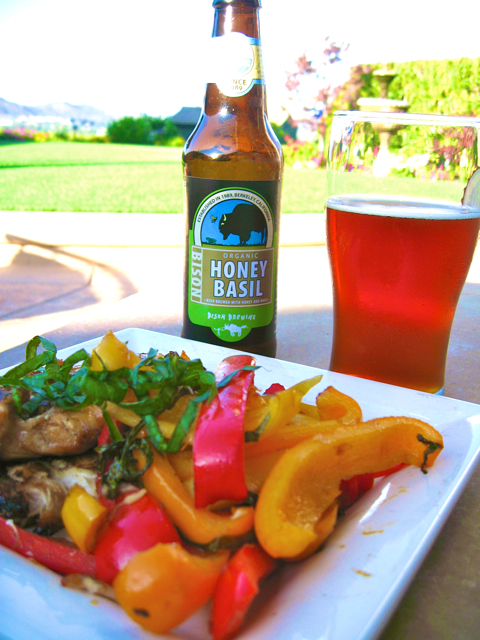 Serve and enjoy on a gorgeous summer evening in the backyard with another bottle of Bison Brewing Honey Basil Ale. 15. Like Bites ‘n Brews on Facebook and then follow me on Twitter. Then eat more. YUM!!!! I bet it was delicious! Great post! Great photography, as well! Have you done a post on your favorite cookbooks or beer brewing books? I’d be very interested in that. I haven’t yet, but I’ll definitely get around to it soon! There are just so many to choose from! Awesome recipe Becki! Definitely going to make this when I get back from the beer bloggers conference in portland! AUGH. So jealous of the BBC!!! I loved the short time I spent in Portland!